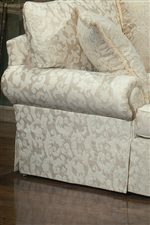 Rolled arms, a tailored skirt at the base, welt cord trim and an abundance of soft pillows make this chair and sofa an elegant pair for entertaining. Impress your friends and family with a set ideal for a traditional living room, but comfortable enough to enjoy sitting in for comfortable conversation with your guests. Choose from over 1,000 fabric choices to complete the look of your items. A coordinating sleeper sofa, loveseat, and ottoman are also available. Browse other items in the 9275 collection from AHFA in the area.